Contributed photo/John Stimpson Bailee Lambright continues to add points with her 6-foot jump shot. 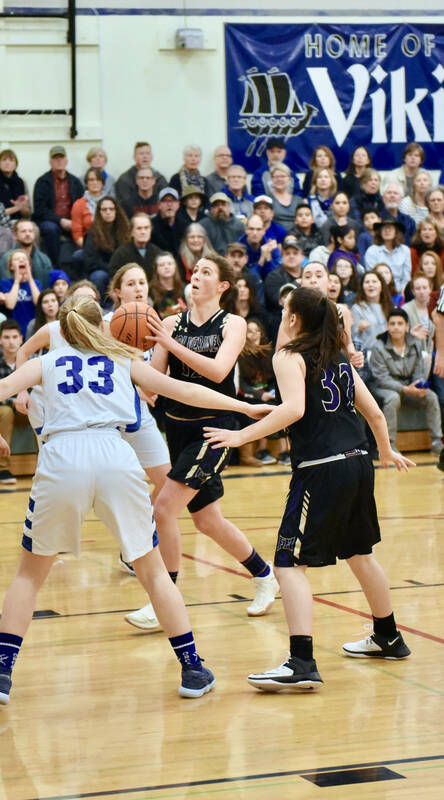 On Tuesday, Jan. 30, the mighty Friday Harbor Wolverine girls varsity basketball team overtook the Orcas Vikings with a nail-biting win in overtime with the score 42-40. The girls play Concrete at 5:30 p.m, Friday, Feb. 2 on their home court. Contributed photo/John Stimpson Tori Polda drives in for a 2-point layup. Contributed photo/John Stimpson Leah Black helps start the scoring early in the first quarter. Contributed photo/John Stimpson Savannah Hoffman drives toward the basket. Contributed photo/John Stimpson Ava Hoffman prepares to launch another shot for the basket. Contributed photo/John Stimpson Kiana Woods on a fast break drives to the basket. Contributed photo/John Stimpson Kiana Woods drives into the basket for another score.